Of all the different combinations of moving average filters to use for a MACD oscillator, we prefer using the JMA - DWMA combination. JMA is ideal for the fast moving average line because it is quick to respond to reversals, is smooth and can be set to have no overshoot. DWMA (double weighted moving average) is ideal for the slower line as is tends to delay reversing direction until JMA crosses it. 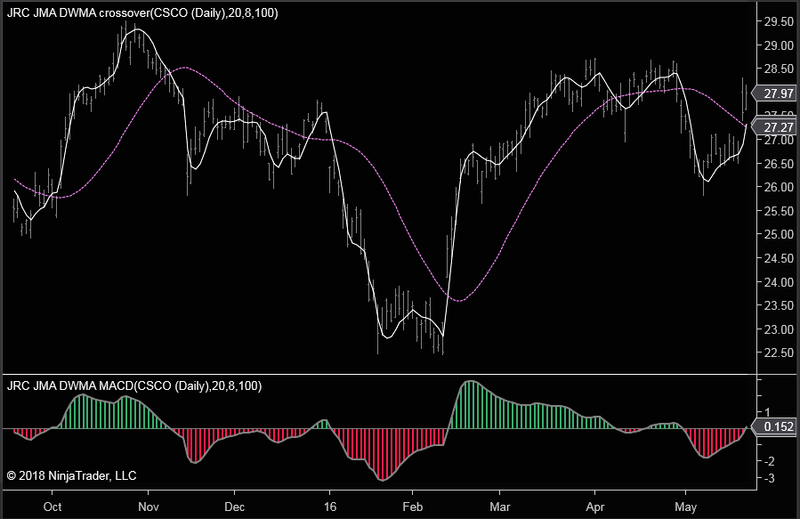 The MACD oscillator is that value representing the difference between JMA and DWMA. You can choose to enable/disable dynamic coloring of MACD oscillator. For more information about JMA, go here.